A young black man one day overhears a conversation. In between the hard clink clink sound of pickaxe striking the earth and in between the groans and grunts of the hard working men deep in a coal mine, he heard the words that gave him hope for life far beyond that of what the small town of Malden had to offer. The words were about a school in Virginia and not just any kind of school. The miners were talking about a school for blacks, a place of higher learning that was unlike the tiny little school in his town. This boy, Booker T. Washington had never heard of a thing like this and he knew that in post-civil war America such a school would be incredibly rare. 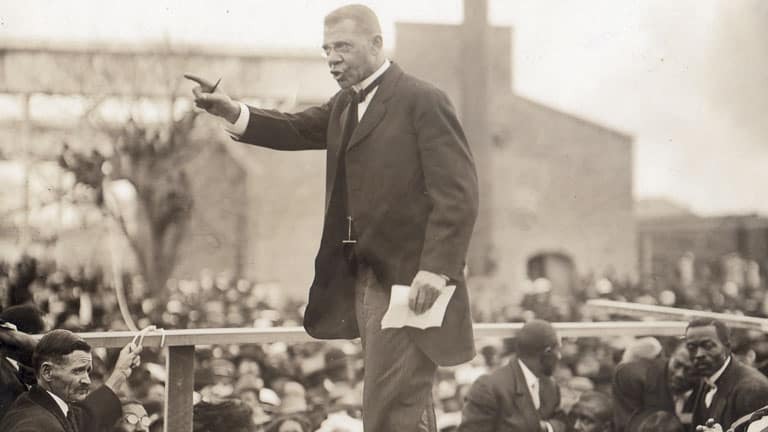 Born a slave, freed by the Emancipation Proclamation and living a hard working life in the coal mines of West Virginia, Booker T. Washington had a great love for education. He worked all night in the coal mines until nine and then would rush to school, which also started at nine. Each day was a fight to get to class on time, but he tried and tried with all of his might, to learn everything he could. The day he learned the name of the Hampton Normal and Agricultural Institute was the day he decided to attend that school. Of course, he was far from a man of wealth, poverty and hard work had been the only life he had ever known, but Booker swore that he would someday go to the school and become a learned man. Not only would he become learned, he swore, but some day he would rise up and became a man of status and class. Despite the massive obstacles of poverty, his skin color in a segregationist society and his lack of extensive education, Booker knew that he was meant for something more than just working in a coal mine day and night. Opportunity came to young Booker T. Washington as he learned about a fearsome woman by the name Mrs. Ruffner, the coal mine owner’s wife. A position for a house servant had opened up and if he were to ever get out of that accursed mine, he knew that he would have to take the opportunity. He was afraid of Mrs. Ruffner, so much so that when he first met with her he was trembling before her, for her reputation was that of severity. She gave her servants, especially the men, a great deal of trouble if they did not do their jobs perfectly and her reputation was one of a strict disciplinarian. Most of her servants left within two to three weeks after getting the job, all with the same complaint: she was too strict. Booker’s desire for escape from the long and hard life of the coal miner drove him past his fear of the woman and he took the job as her servant, hoping to garner funds to get to Hampton. Little did Booker know that his time with her would be one of the best educations that he would ever receive. He learned quickly that her harshness was not without merit, she preferred things to be done right the first time and done well. Adapting to her desires, he found himself working hard to please her and in turn, after only a few short weeks, their relationship grew to be one of a friendship. Mrs. Ruffner supported Booker’s desire for education, so much so that she gave him time enough to go to school for an hour a day and he would spend most of the nights studying. His dreams to go to Hampton were not seen as plausible by many others in his life and even his mother was half-afraid of his dream, fearing that it was nothing more than a wild goose chase. Yet the fire still burned within the boy, Booker knew that he was destined to reach such a school and he would not allow anything to stop him. His time working for Mrs. Ruffner came to an end as he decided that he would make his way to Richmond to find the Hampton Institute. In spite of all the work that he had done, however, the money that he had was little. His family had needed support and while he had been given some money from his brother, there just wasn’t enough to allow for him to afford transportation to cover the 500 miles required to get to that school. Booker made the choice to set out on the journey, in spite of his lack of money. At the time, he had no idea where Hampton was, nor did he know what the expenses to join the school would be, but that didn’t matter to him. All he knew was that the school was meant for him and the fire within pushed him to press forward, even though he wasn’t sure what the future would hold. He departed from his family, leaving his mother, step-father and brother behind as he began to set out on the journey to Richmond. After a long amount of travel, through hitching rides, and walking, Booker T. Washington arrived in Richmond, only 82 miles away from Hampton. His arrival was bittersweet, for he had not a single acquaintance in that city, nor did he have any money with him. Alone and bedraggled, he didn’t even have the money to feed himself, but he still was determined to reach that school. In his attempts to find some way to earn money for food, he came across a captain who was unloading a shipment from the docks. With stomach rumbling, Booker asked the captain if he could assist with unloading the heavy crates in exchange for a small sum of money, to which the captain was happy to oblige him with. They worked together for the day and Booker had enough money to earn a meal. So satisfied with the boy’s work, the captain told Booker to come back tomorrow and work for him again. Booker worked day after day, taking all of the money that he could and setting it aside for his goal to reach the Hampton. To save money, he chose to sleep underneath an elevated sidewalk each night, rather than find a place to stay. So much so was his desire to earn his way into that school that he chose to minimize all expenses, giving up comfort and security to achieve his dream. After such long and exhaustive work, Booker finally arrived at the Hampton Institute with only fifty cents in his pocket, in today’s money that would be the equivalent of a little less than nine dollars. Bedraggled, filthy and without any nice clothes, he found himself facing off against the head teacher who was less than impressed with his appearance. Without any money or semblance of being anything other than a tramp, he tried to convince her with all his might to admit him into the school. The headmaster did not immediately say no, nor did she say yes. She merely allowed him to painfully wait before her as she admitted a great many other students in front of him. He waited hours, desperately attempting to gain some favor with her. Such longing burned within him, he was so close to his goal that he knew if only she gave him some chance, he would be able to prove himself worthy of such a school. That chance came when she abruptly ordered him to sweep one of the schoolrooms for her. With a fury and a passion, he seized hold of the broom and commenced to sweeping the schoolroom three times total, then he grabbed a dusting cloth and made sure to dust the entirety of the room. He moved all of the furniture, pushed his broom into every possible corner, cleaned out the closets and set about cleaning that room as if his very life depended upon it. His life very well might have depended on cleaning that room, for he knew that he had one shot to make an impression upon this teacher and he just had to fulfil his dream of getting into this school. After thoroughly cleaning the classroom several times over and undoubtedly profusely thanking God for his previous time working with Mrs. Ruffner, Booker invited the teacher to inspect his work. She checked the room meticulously, looking for dirt and finding nothing. After a terse moment, she looked at him and muttered “I guess you’ll do to enter this institution,” and allowed him entry into the school. This was the triumph that young Booker had been long waiting for and that moment was the start of an entirely new way of living. His innermost being was filled with joy and he set about to learn as much as he could in his time there. Booker had always dreamed of being a man of status, of being able to affect change in the world and with this access to education, that dream would soon become a reality. There was still a major obstacle to his education, however. That obstacle was tuition. After having cleaned the room with such a fervor, it was seen fit that Booker would do well as a janitor and the headmaster gave him the job in order to assist in reducing the cost of his board. Despite the reduction in living expenses, he still wouldn’t be able to afford to pay for his schooling as he had no money in hand and his commitments to school offered no time for working elsewhere. He purposed that his first task was to remove the cost of room and board entirely, so he set about to work as hard as humanly possible to make his work as a janitor indispensable. He reasoned that if he worked hard enough, they would sorely miss not having him around and would be incentivized to keep him at the school. His plan worked and they told him that he wouldn’t have to pay for his board for the entirety of his stay at the school in exchange for the stellar job that he had been doing as a janitor. Even with those costs waived, however, Booker was still intimidated by the sheer cost of tuition. The school cost about 70 dollars per year, in today’s money that would be around $1200. He simply did not have the money nor did he have the ability to earn enough. Without being dismayed, however, he continued to work very hard at both cleaning and learning, so much so that those around him took note of the energy and effort he gave and desired to assist him with paying for his schooling. His mentor and the leader of the school at the time, General Samuel C. Armstrong, went about finding a wealthy benefactor who agreed to pay for Booker’s tuition costs for his duration at the school. With the school tuition and living expenses satisfied, Booker was still significantly behind many of the other students in terms of wealth. He had no books nor clothes except that which was on his back. Such setbacks were difficult, he managed to borrow books from other students but the clothing was a significant point of stress for him. The General esteemed a well dressed man greatly and Booker became acutely self-aware of how difficult it was to clean a school and attend school in the same outfit. For some time, he tried his best to keep himself clean, but such an endeavor was difficult to achieve. His teachers upon seeing his tenacity and intensity, provided him with what clothing they could find, usually clothes that had been donated from people in the North. He was adamant that without such care and consideration from the staff and the donations from those people he would never have made it through that school. Booker prevailed through the many struggles that held him back in that school. He fought tooth and nail each step of the way, pushing to become excellent and securing himself on the Honor Roll of the class. When he graduated such a school, it was one of the biggest accomplishments for a young man who had arrived to that institution with only fifty cents in his pocket. He would later go on, of course, to lead the famed Tuskegee Institute and become a serious man of political influence, but perhaps one of the greater triumphs of his early life was being able to return to his little hometown of Malden and become a teacher. It was at this school that Booker taught anyone who wanted to learn, regardless of their ability to pay. He tutored them, trained them with the intentions of sending them to Hampton and best of all, he was able to send his own brother to Hampton, the very brother who had once given Booker some of his own money to help the boy achieve his dreams.